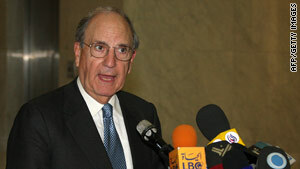 U.S. envoy George Mitchell speaks to reporters in Damascus, Syria, on Wednesday. Jerusalem (CNN) -- George Mitchell, U.S. President Barack Obama's special envoy to the Middle East, was in the region on Thursday, in a bid to get Israelis and Palestinians back to the negotiating table. He planned to spend three days in Jerusalem and Ramallah, a Palestinian city in the West Bank. Mitchell's latest efforts to restart the stalled peace process may be complicated by Israeli Prime Minister Benjamin Netanyahu's demand that Israel maintain a military presence along the West Bank's border with Jordan. In remarks to the international media Wednesday, Netanyahu said that to maintain Israel's security and prevent the smuggling of rockets into the West Bank, any peace deal with the Palestinians would "require an Israeli presence on the eastern side of the prospective Palestinian state." Under current agreements between Israel and the Palestinian Authority, Israel maintains full control over the West Bank and its borders, while the Palestinian government oversees administration of major population centers. Chief Palestinian negotiator Saeb Erakat slammed the Israeli leader's remarks, saying Netanyahu was sabotaging a two-state solution by trying to dictate the outcome of negotiations. "We hope this will be an eye-opener for ... Mitchell, because dropping Netanyahu's conditions is a must for the resumption of negotiations," Erekat said. In his comments Wednesday, Netanyahu blamed the Palestinians for lack of movement in restarting negotiations. "The Palestinians have climbed up a tree. And they like it up there," Netanyahu said. The prime minister said his government made a series of concessions to the Palestinians, including a 10-month moratorium on new West Bank settlement construction and the removal of dozens of checkpoints and roadblocks. "People bring ladders to them. We bring ladders to them. The higher the ladder, the higher they climb." Netanyahu said. "I'm prepared for peace. Are the Palestinians ready for peace?" Palestinian Authority President Mahmoud Abbas has refused to re-enter negotiations until Israel enacts a complete freeze of all settlement construction in the West Bank and East Jerusalem. A Palestinian proposal to re-enter negotiations if Israel unofficially halted construction in East Jerusalem for a time was rejected by Netanyahu, with one senior Israeli official calling it "ridiculous" and "spin before [Mitchell's] trip." "This proves again that Netanyahu rejects resuming negotiations, according to the basis of the peace process and the obligations of the Road Map, which clearly stress on a total halt of all settlement activities," said an Abbas spokesman, Nabil Abu Rudaineh. The 2002 Road Map for Peace was an outline of steps that Israelis and Palestinians needed to take toward a permanent two-state solution.